What do they say about giving idiots swords? Don’t under any circumstances give an idiot a sword or indeed any other weapon, but look what those bunch of monsters in Saudi Arabia have done! They have armed themselves and an idiot from England with the damn things. 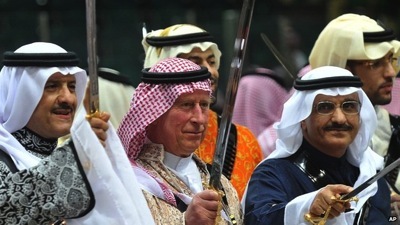 I have a feeling that this is the big ritual performed by the Saudi royal family before they chop off the head of a princess or two for wearing lippy, or secretly hiding a picture of Tom Cruise in their underwear drawer, though I am not sure and they are conflicting reports as to what the ugly bunch of sword wavers are actually doing. 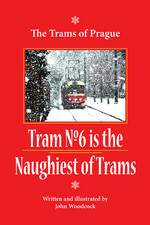 If you read the international (non-British) press they heavily criticise the idiot from the UK who likes to dress up in fancy dress as commander in chiefs of this and that in the navy, army and air force and wear an imitation gold sword at his side and probably jumped at the chance of wearing a real gold sword at his side and having the opportunity to wave it about with all the other clowns. 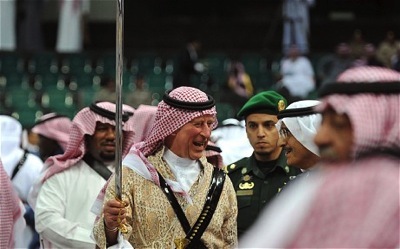 However if you read the British press they will say that “prince charles joined members of the Saudi royal family for the Ardah – or sword dance – in the capital Riyadh.” Then they will go on to describe the outfit, called a ‘thobe’ if anyone cares? And then drone on about the number of sequins and jewels hand sown into the fools ankle length garment, yes that right a ‘thobe’ to you and I! 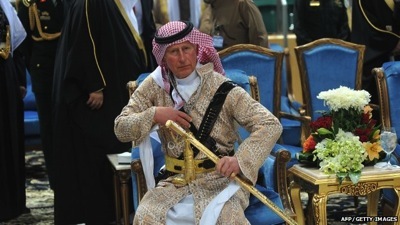 I would say that the word ‘thobe’ could be used as a perfect description of what that moron from England looks like wearing traditional Arab dress… a right royal thobe in fact. Just look at this pompous ‘prince’ oops I think I spelt ‘prick’ wrong there sorry! No wonder the Aussies and Kiwis want to ditch the British royals as their heads of states, because it won’t be long before this right royal thobe is their head of state too and has the opportunity to flounce around the world looking like the fool in the pictures above on their behalf. I honestly didn’t think that the Aussies or Kiwis had such taste, all I can say is good luck to their campaign and fingers crossed that one day an enlightened British people, hopefully by that time minus Scotland (they deserve their independence they have suffered for long enough) do the same.